Like most hot-blooded, wanderlusty girls who have been influenced by Elizabeth Gilbert’s Eat, Pray, Love in their 20s, I had Bali at the top of my Asia to-do list for years. For the uninitiated into this cult classic chick lit, Bali was the Love portion of the three part memoir set in Italy, India and Indonesia. 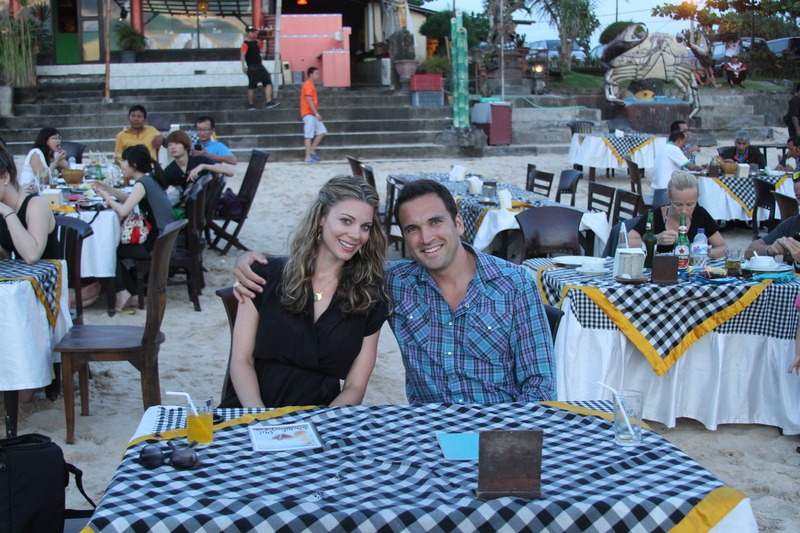 Gilbert recounts her year-long solo quest to restore herself and finds love in Bali. The storyline became more ubiquitous when Julia Roberts played Gilbert in the movie version. I was one of those girls who romanticized the idea of running away to this intoxicating ancient kingdom to find myself in a beach-side hammock, monkey temple, or soothsayer’s shop. Bali was all those things. It didn’t disappoint a smidge. But now that I’ve finally made it to Bali in my 30s (at the time with a hyperactive husband and an eight month-old baby boy in tow), I saw a different and unexpected side of it. A side that perhaps Elizabeth Gilbert missed, even after being there for months. It’s a side that the Gilbertites will surely miss. If you’ve been to Bali, it’s hard to ignore the droves of solo women travelers in their 40s or 50s, dressing the part by wearing strange combinations of temple pants and hiking gear, on a quest to find themselves through meditation and beach-side therapy. My husband (oblivious to the book and movie phenomenon) kept a tally of these loner types and lost count on the second day. In fact, this type of tourist has become such a cliché that it’s given birth to an even newer type of traveler- the anti-Gilbertite. Today, bloggers and travel writers whine on the internet about how Gilbert ruined Bali, while simultaneously claiming they’ve found the real Bali, an even more remote slice of beach or countryside with few people in sight, none of them being white. Notwithstanding the fact that 80 percent of the Balinese economy depends on tourism, these noble solitude-seekers may have also missed it. Yes, Gilbert is right about the mystically alluring way the Balinese relate to each other. There’s an intuition, a genuine kindness from strangers. But there’s a deeper side that only a parent would really see and find remarkable. 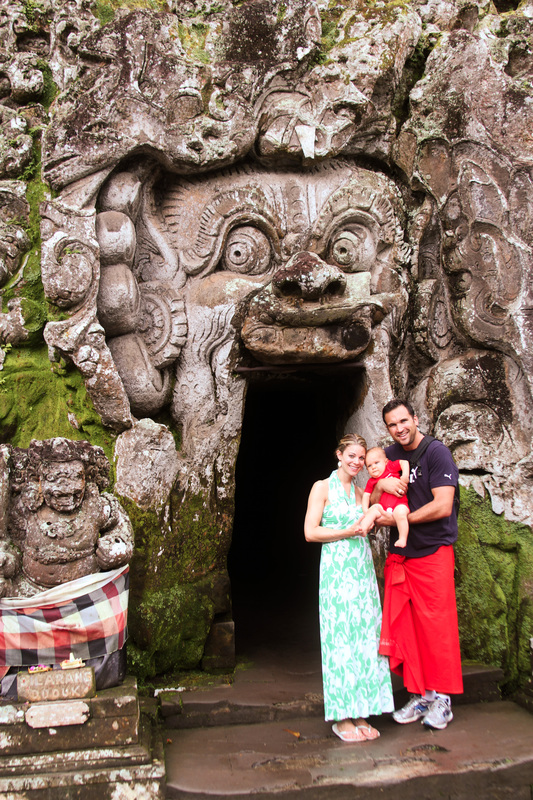 The great irony is that while many go to Bali to “find themselves”, the secret to Bali lies in community. We live and work in Tokyo, renowned for its increasing intolerance for fussy children (and subsequent negative birth rate) and we recently had a challenging experience keeping the little guy happy in Hong Kong, so we were reluctant to make another trip with him so soon. “But Bali is different!” our friends with kids urged us. But they couldn’t quite articulate what made it so different. After a full day of flying, we joined the snail-like queue of tourists slugging through the hot, stinking bowels of the Denpasar airport. Our sweet natured eight month-old reached his melt-down hour about 11pm when our little dictator morphed into a sweaty, flailing monster in an Ergo carrier. And then the first bit of magic happened. A smiling gentleman appeared out of thin air, unhooked a velvety rope, and calmly pulled us aside, escorting us to the very front of the customs line. I could hardly face the sneering crowd of Australian hipsters and Gilbertites, but I’m sure they too were as relieved as we were to have the screaming monster out of there. We decided to stay in the Nusa Dua gated community for the first half of the trip. Sure, we noticed that the Lonely Planet authors aren’t too kind on Nusa Dua, but I suspect they’re not travelling with children when they write these books. Upon meeting Henry for the first time, hotel staff would always ask for his name, gender and age. It didn’t take us long to realize they weren’t just being cordial; they were genuinely interested in our mini Mussolini who had re-morphed into his normal, fun-loving self by then. They expected reciprocal interest in their family and relished the opportunity to brag about their own brood. It was an easy and instant connection. 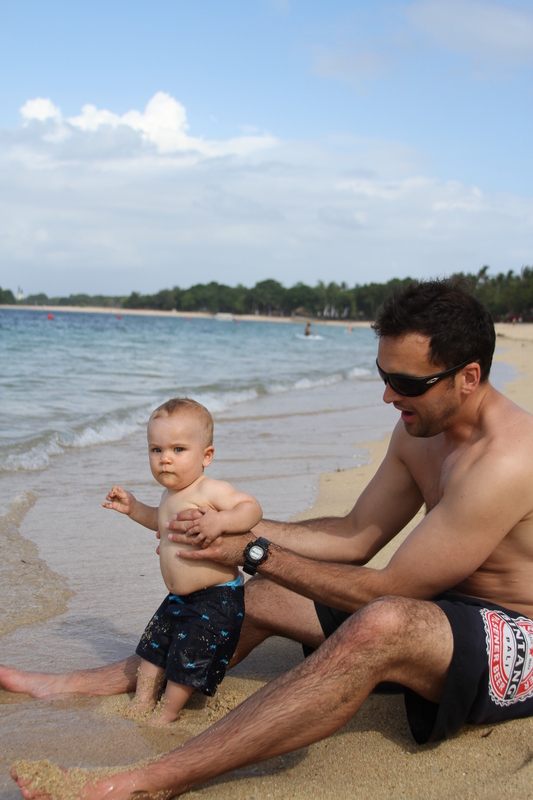 We introduced the little fascist-turned-happy-camper to the beach for the first time at Nusa Dua. And a gorgeous beach it was. 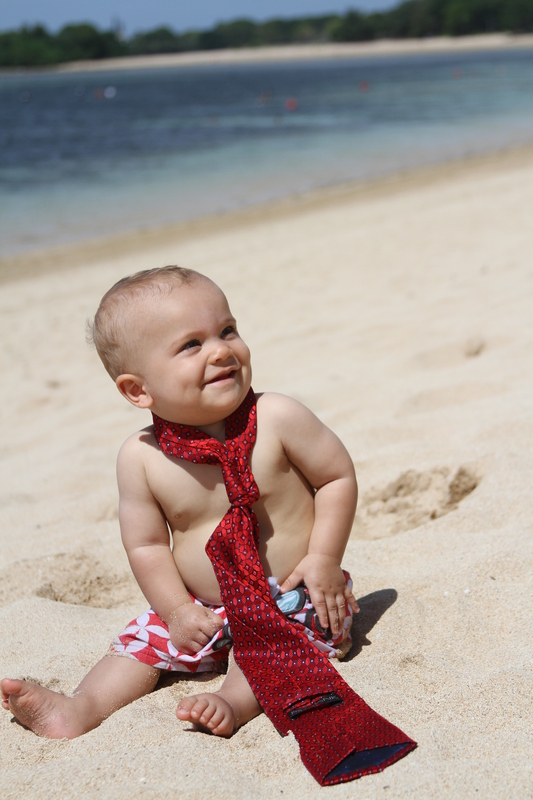 Miraculously, he did not eat the sand! My husband and I looked at each other in shock as we watched him calmly crumble fistful after fistful of sand into the wind, mesmerized by the texture and movement of it. 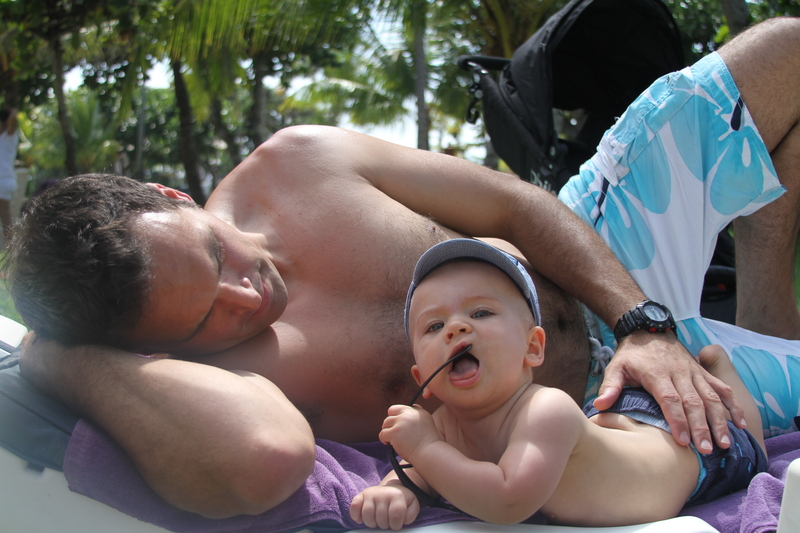 We spent four days lazing around the beaches, pools, catching up on reading and napping together as a family under the palm trees. Henry even indulged in the local fare, including crispy duck, savory chicken breakfast porridge, green pancakes with bananas and freshly grated coconut and ate everything with gusto! I don’t recall hearing a single fuss from him as he embraced his inner naturalist, strangely up with the sun each day and taking long afternoon naps- two things he had never done in his short lifetime. Coming from a place where it’s overcrowded and overcast most every day of the year, our little pale-faced boy was high on sun-delivered vitamin D, tropical fruit and wide open spaces. It was also at Nusa Dua that he had his first real mutual love affair with an adorable, doting, fairy-like Balinese girl named Julie who watched him for a couple of hours each day while we enjoyed bike rides outside the Nusa Dua complex, downed stiff cocktails, and indulged in romantic, uninterrupted dinners. Our favorite was the traditional rijstaffel experience. Rijstaffel means “rice table” in Dutch. 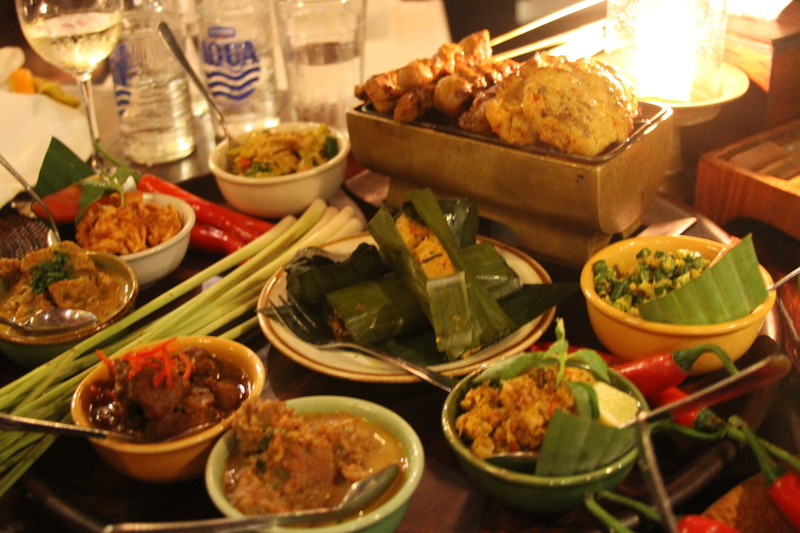 The meal consists of dozens of tiny side dishes made from fruits, vegetables, meats, spices, nuts and pickles. Its colonial origins were meant to impress visitors at the island’s exotic abundance. Impress it did. It was the first time since we’ve become parents that we’ve really felt the passion of being on vacation with each other. When we met Julie the second day, Henry squealed with delight, recognizing her from a distance as we strollered up to our hotel room to meet her. It was as if Mama didn’t exist anymore; he literally leaped into her arms. I was slightly jealous when I noticed that she was equally thrilled to see him again. It was more than just a job to her- she truly enjoyed my child. At the end of our week she emailed us a photo montage of pictures she had taken on her blackberry of the two of them snuggled together, complete with superimposed hearts graphics. But come to find out, Julie was just the first of many hearts that our little cassanova haphazardly discarded across that great island. 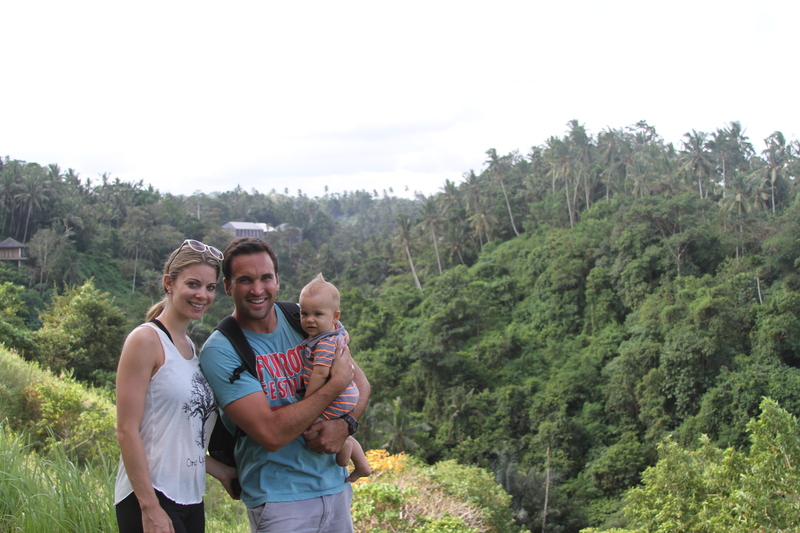 Our next stop was in the mystical rain forest town of Ubud in the island’s interior. 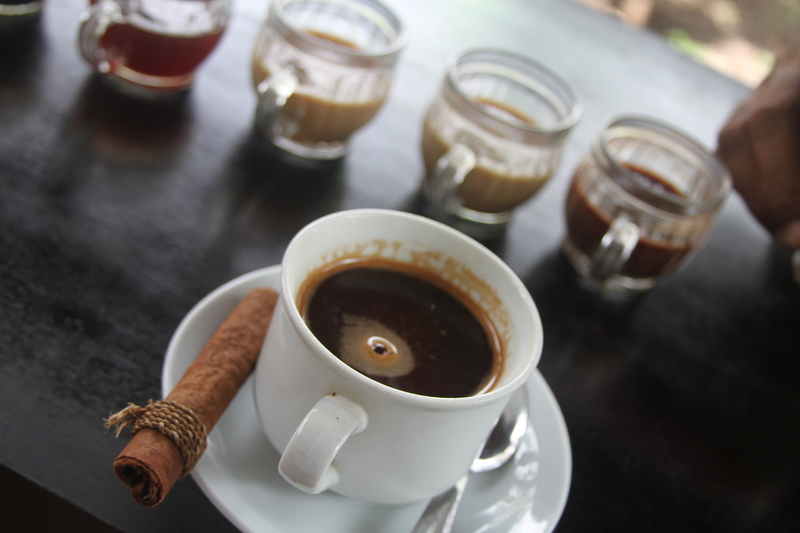 Ubud is the artistic and spiritual capital of Bali. Balinese and European artists have been flocking there for decades to find purity in nature and inspiration. And there was no shortage of Gilbert wannabes. We booked a modest boutique hotel that had advertised babysitting services. When we arrived, we were disappointed that the hotel actually didn’t have any babysitters. But come to find out, it didn’t matter at all. We toted Henry around to every restaurant, art gallery and boutique where our senses led. Our child was met with such overwhelming love and attention. It seemed everyone couldn’t get enough of our little fat blue-eyed baby. We usually dread taking him out to dinner because he doesn’t want to sit in his high chair for more than twenty minutes. But we didn’t have to fight the dinnertime battles, as it seemed everyone was dying to get their hands on him. The waitresses took turns playing with him, as if it was the favorite part of their jobs. He disappeared into a few kitchens, emerging once with a cracker in his hand. Rather than stressing, we reached a point where we just decided to let go and enjoy it. The Balinese have a unique way of taking the edge off of travelling with a baby. Our taxi driver gave us a lesson in what makes their perception of children so special. It all starts with the names. Individuality is eschewed in favor of traditional family ties. The firstborn child is always named Wayan, the second is Made, the third is Nyoman and the fourth is Ketut, all followed by their family names. The 5th kid gets named Wayan and so on from there. Life in Bali is never alone, and they believe the younger the child the closer to God. The Western concept of me time doesn’t exist and instead children are taught at an early age to be in harmony with others and their surroundings. The Balinese believe that people who venture off on their own are vulnerable to visits from bad spirits. Furthermore, babies aren’t allowed to touch the ground until they’re three months old. 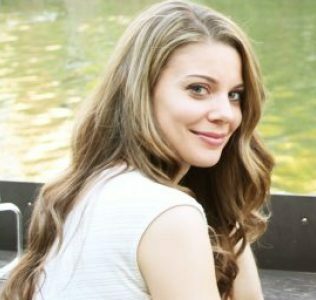 Thus to a Western mother who is used to the stress of managing her child’s annoyances in front of strangers, it’s a huge relief when those strangers don’t have a selfish bone in their body and are more likely to embrace and celebrate the unpredictability and chaos inherent to babies and children. We made it a point to have some type of body treatment every day. They don’t advertise it, but most places serving tourists will happily offer to take your little tike off your hands while you enjoy their service—there are few things better in the world than a $7 couples massage that includes babysitting. 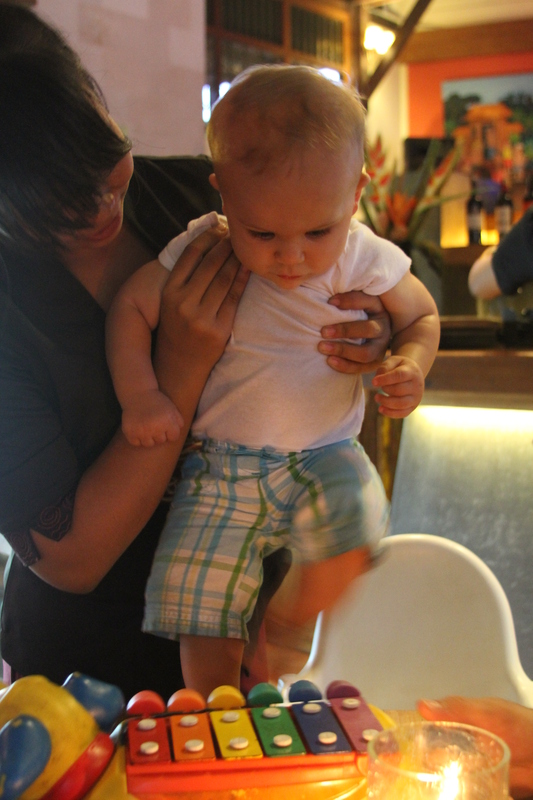 Normally I’d be reluctant to allow a stranger to entertain my child, but in Bali it just felt right. Henry would always return blissful from the extra attention and affection. 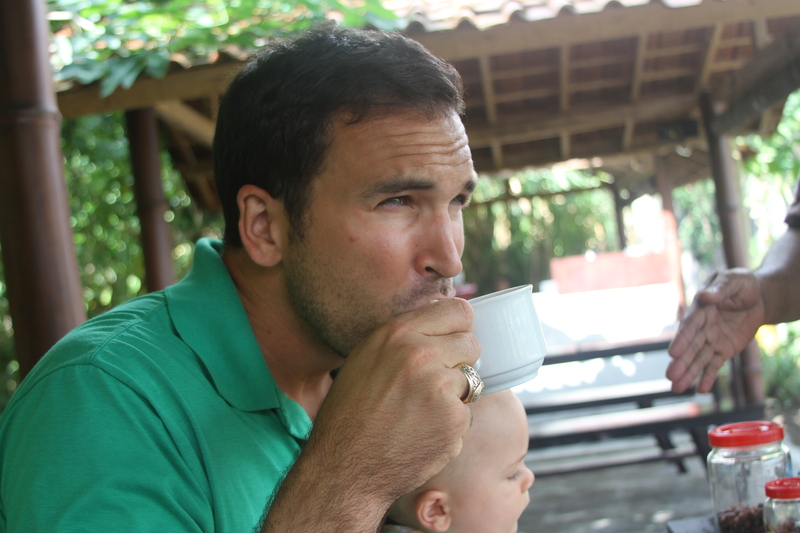 After a long stroller ride through some of the local villages, we cultivated our best coffee snob faces at a local coffee luwak plantation and spice garden. While we buzzed on some 10 different kinds of coffees and teas, our plantation guide treated Henry to a softly narrated tour of the garden. I don’t know what we were more surprised by- our enjoyment of “cat poop” coffee or Henry’s newfound attention span. We had a similar experience at the Elephant Cave. We don’t make a habit of employing random freelance guide peddlers, but having already fallen in love with the Balinese we obliged. Our guide made the 9th century sanctuary come to life while insisting on holding our squirmy tot while navigating up and down staircases, temples, and rice paddies. Henry thought he was the Funniest Man on Earth when he made silly faces at him. What made it so remarkable was that he wasn’t just being nice. It seemed he adored our little Wayan Patton as much as we did. So come to Bali and enjoy walking in Gilberts’ fictional footsteps, or come and join the anti-Gilbertite movement and its ironic quest for originality. But whatever your angle, if you’ve got small children, this island paradise should not be overlooked!